An iPad is a device that is an iOS-based device manufactured by Apple Inc. Since 2010 iPad has been launched in various versions. IPad is a popular and most useful device. IPad doesn’t support all video formats it perfectly supports only Mp4 video files. That’s why we have come with this article which is all about How to play Mp4 Videos on iPad. 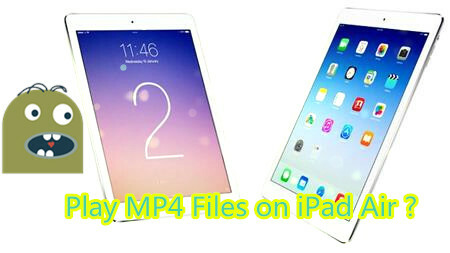 Also, we will tell you how to convert MP4 to IPad format. Since all Apple products have an Apple specific Operating system, they do not readily support all types of files and media. The latest iPad model is iPad Pro which is launched in the market in March 2016. It is 9.7 inches. An iPad can do all sort of things like shooting videos, gaming, clicking pictures, playing music, and internet functions like browsing and emailing. Gaming, GPS navigation, and social networking are smooth. This has a multi-touch screen and a virtual keyboard. John bought an iPad recently. He is a technical geek and loves to have gadgets of the latest configurations available in the market. iPad is definitely a big shot for him and he has just fulfilled one of his many big dreams. This is his first Apple device and he is all excited but alas! All his huge collection of MP4 videos is not getting transferred to the new gadget! Conversion of MP4 videos to other formats to play on iPad is not a heavy task. We have iSkysoftTunesOver to help convert the videos in the iPad supportive format.iSkysoftTunesOver is a boon to the conversion facility of MP4 videos. It is highly recommended to use the iSkysoftTunesOver to convert MP4 files format video files in a format supported by iPad. The iPad can be of any of its versions like the iPad mini, iPad Air, iPad 4, iPad, iPad2, iPad 3, iPad or iPhone 5S, iPhone 5C, iPhone 5 and iPhone 4S. Allow us to guide you through the step by step procedure for converting MP4 videos to iPad friendly format. iSkysoft TunesOver bills itself as the ultimate media management solution for your iDevice and Mac. The app allows you to transfer music from your iOS device to your Mac. You can also transfer iPhone videos, playlists, and photos to your Mac. You also can convert the iPad friendly videos with this app. Converted videos don’t seem to lose any resolution or sharpness. Just follow these steps to achieve the task. These are basic steps one needs to follow. Hardly 3-4 in number they save your time and energy. Converting MP4 videos to iPad friendly format is not a rocket science. It’s a damn easy task. Down below we are providing you step by step process that will help you to convert videos. Just have a read carefully. Download iSkysoftTunesOver Converter and install it. Make sure it is the latest available version of the converter. After the iSkysoftTunesOver Converter is installed successfully please connect the iPad to your computer (Where your MP4 files are saved). Now you should launch the application you have just installed on your iPad. Now comes the time to add all the desired MP4 files to the program. This can be done by clicking on the left side. Simply click on the ADD button. It will open the available files. Select the files and click on open. Now since the videos or files are not supportive the iSkysoftTunesOverConvert will ask you to convert the files into IOS-optimized format? Click on YES. Voila! You are done. You have successfully converted the MP4 files into the iOS supporting format. This software will convert the videos in a high-quality format. Your work is done because, after the conversion, the files will be automatically copied to Videos application of the iPad. You can check “Videos” application and you will find the files there. The above guidelines have been prescribed by the Apple Inc. for the formats of videos and other files that will be supportive of an iOS. The various versions of iPad mini, iPad Air, iPad 4, iPad, iPad2, iPad 3, iPad or iPhone 5S, iPhone 5C, iPhone 5 and iPhone 4S all support the same features. Technology develops daily and with time the versions keep changing, but as far as we have converters like this which is so easy to operate and convert MP4 files into desired iOS supportive formats. The iSkysoftTunesOver is highly recommended for such purpose. And the statistics show that iSkysoftTunesOverhas been downloaded and used the maximum for such compatibility issues with the iOS devices. TunesOver is one of those market-leading products by iSkysoft that provides a real-time hack for everyday usage. Other than producing HQ gif images and transferring them to a variety of Apple devices. iSkysoft TunesOver can convert the videos without losing its quality. We will recommend you to try it at once. If you know any alternative of this then please share with us.